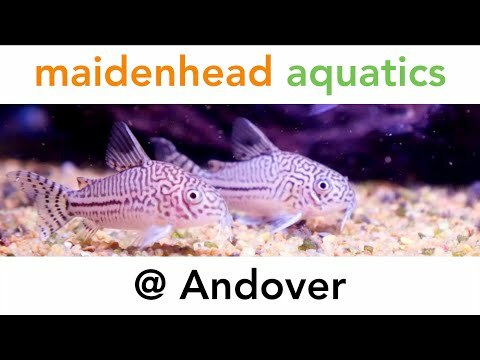 At Maidenhead Aquatics at Andover, we're proud to carry the best-known brands for all your tropical, coldwater, marine and pond needs, such as Blagdon, Interpet, Jbl, ADC, Hozelock, Hagen, Evolution Aqua, Tetra, Aquaone, Seashell Aquariums as well as many others. However if you can't find what you need, please chat to a member of staff and we'll do our best to order it for you. We also carry many other items such as the popular AquaOak range of aquariums and Aquamanta filters which ,along with many other lines are exclusive to Maidenhead Aquatics. We also run many promotions and special offers across the store, so please ask staff for details of our great deals. Our fish house contains nearly 140 aquariums that offer tropical, coldwater and marine fish and invertebrates as well as potted and bunched aquarium plants. We also provide "live rock" as well as R.O. water and salt-mix R.O. water. We are also proud to offer a wonderful outdoor pond section that caters for all your water gardening needs like pond fish, koi, pond plants, ponds, waterfalls etc. So please come down and see us or give us a ring. Our helpful, knowledgeable staff are always ready to help!